Can you believe in a Unicorn? They’ve existed, in large numbers, for some seven years now, thanks to Bailey of Bristol. It’s the company’s flagship range, the first of which was spotted back in 2010. 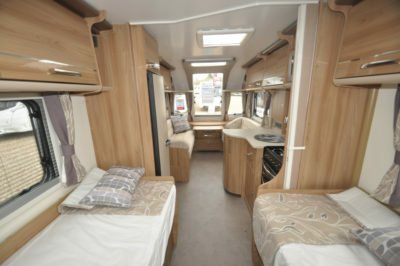 With its two fixed single beds and full-width end washroom, the Cadiz has emerged as one of the most popular models in what is currently a 10-strong line-up (six single-axle, four twin-axles). Bailey has continued to enhance its Alu-Tech construction formula, too, albeit the basics remain – GRP outer and inner skins bonded to aluminium extrusions, for a structure that’s almost wood-free – the floor continues to be made of conventional materials. Latest variants get a six-year bodyshell integrity warranty, although you can extend this by another four years if you’re planning on keeping your Cadiz that long. To be fair to Bailey, including Alde’s heating and hot water system in a unit this size and still coming in under 1,500kg is a major achievement. There’s a downside, of course, in the all too paltry payload that every manufacturer seems to think it can get away with. Those two single beds aren’t exact twins. They’re the same 0.70m wide, but the nearside is the longest, at a generous 1.91m, while the offside is just 1.78m. The mattresses are thick and tend towards firmness, although there’s nothing to stop you adding toppers or even switching foam style altogether. If you want to accommodate more, don’t forget the lounge can offer two singles or a transverse double. In its normal daytime mode, the lounge is really opened up by the light that comes in via that extended central front window, supplemented by a Heki unit directly overhead. The open plan feel continues to the kitchen. 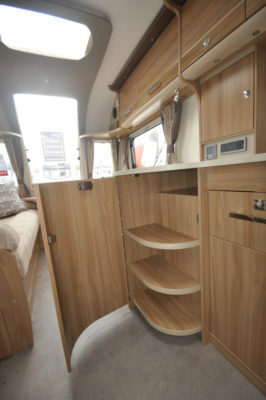 The main unit is along the offside mid-‘van, with no shortage of ways to cook your meals. The Thetford Caprice cooker has a dual-fuel hob and separate oven and grill, plus there’s a Daewoo microwave oven set high (but not too high). 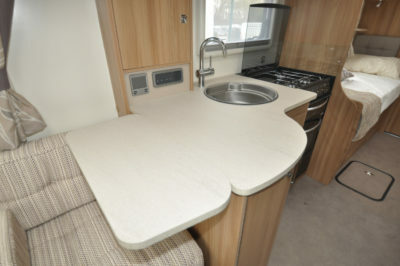 The circular sink is served by a swan-neck mixer tap, and not only is there a good expanse of worktop to its left, this can be extended by a lift-up flap. Completing the food facilities, there’s a Dometic 9330 narrow-bodied fridge with removable freezer box directly across the corridor. Maximum capacity is a more than generous 134 litres. Behind those beds, it’s an easy walk straight into the washroom, where there’s a fully-lined shower cubicle in the right-hand corner, with an Ecocamel showerhead and a handy, high-level ledge for soaps and shampoos etc. There’s just a single plughole in the tray, however. Note, too, it’s a clear window directly behind the toilet! One downside is the location for the free-standing table. It stows in the wardrobe (itself in the washroom) for travel, meaning a potentially hazardous journey every time you lug it out to put up in the lounge or, if more suitable, in your awning. 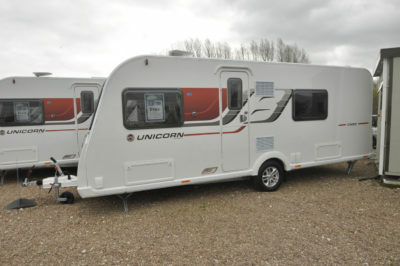 But there’s a new safety feature on all Unicorn caravans – a Tyrepal Tyre Pressure Monitoring System is fitted as standard – which will also get you a 5% discount on your caravan insurance with Caravan Guard. According to Bailey, it was always a popular choice as an optional extra but now it’s a permanent feature. 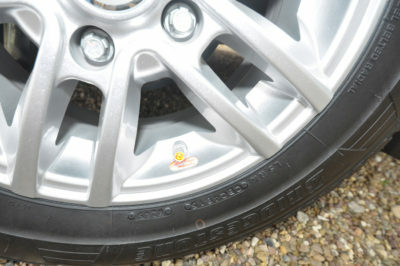 Safety is clearly a priority for Bailey: “With tyres condition and pressure being such an important part of vehicle safety, in line with the automotive industry, we felt it was important to provide our customers with that extra level of protection,” said Simon Howard, Marketing Director at Bailey. Plus there’s the TRACKER Retrieve system as standard, which will help lower your insurance premium. As you can see from the panel opposite, the Cadiz isn’t short on rivals, but Bailey nearly always manages to pull off the trick of price-beating its competitors. Such is the way Bailey continually develops its products, it wouldn’t be a surprise to see a Unicorn upgrade in the not too distant future. Now, then, might be the ideal time to step in and grab a mid-season bargain. Safety & security Al-Ko ATC, Al-Ko AKS stabiliser, laser-balanced wheels with security tyres and anti-tamper bolts, Tyrepal Tyre Pressure Monitoring System, Al-Ko Secure wheel lock, Tracker Retrieve with 3 months free subscription, smoke alarm, carbon monoxide detector. 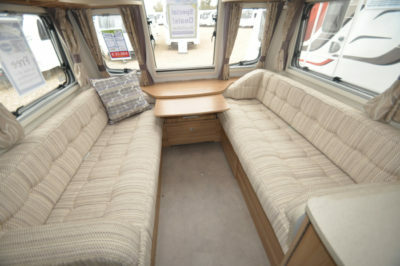 Key options Trafalgar upholstery (£225), bedding set (£209), four-year extension to bodyshell warranty (£265), three-year extension to manufacturing warranty (£439). 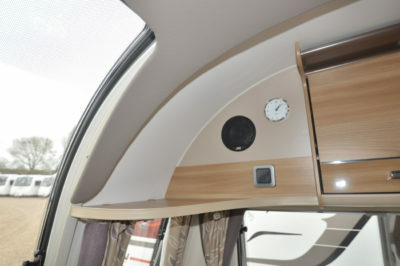 *Caravan insurance cost based on Bailey Unicorn Cadiz caravan retailing at £23,064 fitted with hitchlock, Al-Ko Secure wheel lock, Tracker Retrieve (with three months free subscription), tyre pressure monitoring system and Al-Ko ATC. Kept on drive at HX4 0BE. Caravanners over 30 years old, claim free for 3 years and a member of a caravanning club. £100 excess. 180 days European cover and up to £75 per day for up to 15 days emergency accommodation cover included. Legal expenses cover, extended European cover and other emergency accommodation expenses cover options are available at extra cost. Quote includes 10% online discount and 10% Insurance Premium Tax and is correct as of 20.3.17. We bought a new cadiz in 2016. Absolutely made up with it. The quality is 1st class. Only wish that there was a door under the two beds on the inside. Other than that it’s brilliant. Thanks for sharing your feedback June. Happy caravanning. What size awning will I require for a CADIZ 2017? In the Bailey Cadiz the battery is located under the carpet between the beds. After a bit of use the outline of the plastic trim around the battery box becomes apparent after a little while. To over come this i have cut a shape from 6mm ply to fit inside the plastic trim. This brings the carpet level and you will not see the trim outline. We have a 2015 Bailey Cadiz and love it. There are a few comment on payload. I would like to inform all that for £66.00 Bailey will send you a sticker to upgrade your payload to 1550 kgs. The order description is Unicorn lll Cadiz Max Upgrade Kit. All you need to do is stick the new sticker over the old one and you have an upgrade. Hope this helps. We looked at the 2016 model when choosing our first fixed bed model, but the problem mentioned in the review of a shorter second twin bed ruled this van, and several others, completely out. 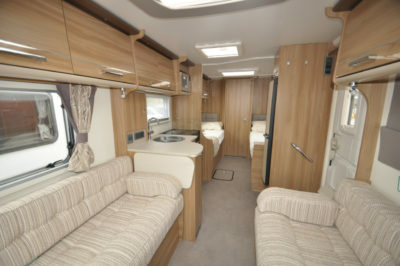 The Caravan we chose – the Pegasus Rimini – has twin beds on the same floorplan, with a longer second bed. We love it. Please, manufacturers, don’t assume all couples fall into the “one tall and one short” category! 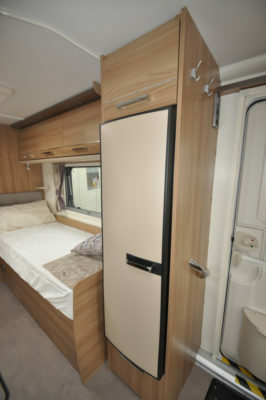 Brilliant Cadiz, just love it, 2016 model, value for money , quality with comfort. The Alde heating and hot water system is so quiet, especially at night, would not ever go back to blown air system. Review above is very accurate and I do concur that the one drawback with not only Bailey, but with all caravan manufacturers is the lack of payload. Invariably this leads to overloading of caravans, on purpose or legitimate mistake by the owners,so easy to do. Perhaps insurance companies could work on this with the manufacturers. We have a Cadiz 2016 and are able to get a Avtex 21inch in the allocated opening at the rear of the fridge with no problem. Bailey state 18.5 inch is the max, however if you fit a quick release bracket you are able to fit your TV to the bracket either from above or the side. I do agree the TV does seem a long way away. A good balanced review. I would also add that the gas locker amidships provides better balance and is also a good higher storage compartment – no banging heads on a front locker catches. The TV position adjacent to the fridge only accommodates a 12in set and is a bit far away from the front seats, but is a fair compromise. Curved storage in the kitchen is very handy for storing toaster, slow cooker and pans, rather than under the cooker itself. Shoe locker by the door is good as is the external n/s side lockers which are not found on new end central bed layouts. But why arent they fitting USB points in froont shelf as standard? Hi Neil, yes the floor is still made of conventional materials. Thanks for the lovely feedback Maurice. We hope you love your new Cadiz and have lots of fantastic holidays with it. Hope your first trip is somewhere good…? 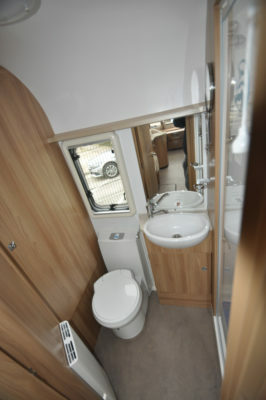 The Unicorn range from Bailey are in my opinion very good caravans, even with a clear toilet window! It is located very high up when viewed from the outside. One point though the Alu tech construction does not give a wood free construction, the floor is still ply wood, we found this out on our first unicorn which showed 60% damp along the front on its first service. It was fixed under warranty. Hi Erwin, you’re correct. We checked with Bailey and only the upper bodyshell panels in their Alu-Tech construction system are timber-free. The floor is made of conventional materials. I’ve amended the review accordingly. As a Cadiz owner this review is well balanced. However some light from the large front window is lost when you place the telly in front of it!